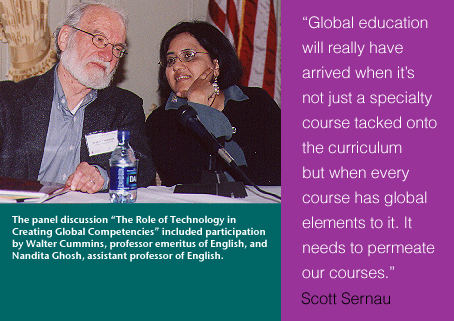 That question aptly set the stage for a two-day conference on Developing Global Competencies in Higher Education, held at Fairleigh Dickinsons College at Florham April 4 and 5. 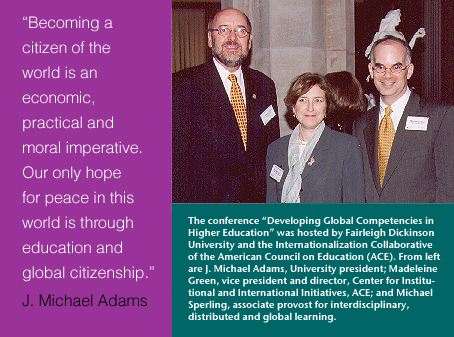 Designed to foster a dialogue among educators about global education and global citizenship, the program was sponsored by the Universitys Office of Interdisciplinary, Distributed and Global Learning and the Internationalization Collaborative of the American Council on Education (ACE)  and supported by a grant from the AT&T Foundation. Speakers included Adams, current and former United Nations ambassadors; a sociology professor who has written two books on globalization; a leading international advocate from ACE; a veteran study-abroad administrator; key members of FDUs global education efforts, particularly faculty involved in using technology to bring the world to the classroom; and members of the Universitys innovative Global Virtual Faculty program. More than 75 college faculty and administrators from East Coast universities, including 18 FDU faculty and staff, attended the conference. Sernau referred to a list of nine goals for globally competent learners developed by the American Council on International Intercultural Education. The globally competent learner, 1) is empowered by the experience of global education to help make a difference in society; 2) is committed to lifelong, global learning; 3) is aware of diversity, commonalities and interdependence; 4) recognizes the geopolitical and economic interdependence of the world; 5) appreciates the impact of other cultures on American life; 6) accepts the importance of all peoples; 7) is capable of working in diverse teams; 8) understands the nonuniversality of culture, religion and values; and 9) accepts responsibility for global citizenship. Among other skills mentioned by Sernau are some new ones (Internet skills, how to find and assess information), some old ones (world history and geography) and some timeless skills (intercultural communication, how to communicate with those from different backgrounds and, most importantly, how to listen to other perspectives). One of the conferences keynote speakers, H.R.H. Prince Zeid Ráad Al Zeid Hussein, permanent representative of Jordan to the United Nations, went a step further and recommended students study and work in other parts of the world. We return to the question of what exactly are global competencies? In concluding dialogues, breakout sessions involving all the attendees created specific reports fusing the various definitions and practices addressed during the event. and recognizing the interconnectedness of economic, social, political and environmental systems. Building on those experiences, Fairleigh Dickinson faculty presented The Role of Technology in Creating Global Competencies, moderated by Jason Scorza, with Walter Cummins, professor emeritus of English; Nandita Ghosh, assistant professor of English; and Francis Ingledew, associate professor of English and comparative literature and director of special programs, University Core Program. Similarly, while Ingledew observed that the Web opens up to students a quantitatively different experience from the traditional classroom, it demands significant attention, and we must guard against the illusion that the world is so easily found at our fingertips. Nandita Ghosh, who is teaching an online course using Global Virtual Faculty, says these scholars and practitioners are giving me and my students a sense of interconnectedness with the rest of the world. She adds that they challenge common assumptions and provide a real sense of the cultural differences that exist in the world. Four GVF members (seven in total attended the conference) took their turns at giving presentations. 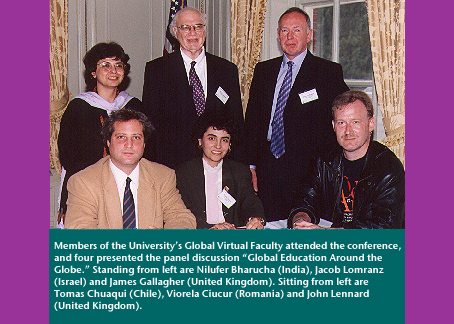 In a session titled Global Education Around the Globe, Nilufer Bharucha (India), Viorela Ciucur (Romania), Tomas Chuaqui (Chile) and John Lennard (United Kingdom) discussed how their countries viewed global education and their experiences with Fairleigh Dickinsons distance-learning initiative. Ciucur said that, as her involvement deepened, she could see students horizons expand and see them become more conscious of themselves as global citizens. Fairleigh Dickinson was the first ACE Internationalization Collaborative member to host a regional meeting exploring global learning. The collaborative is an invitational forum with approximately 45 colleges and universities committed to advancing internationalization.